Located in New London, Connecticut, the Lyman Allyn Museum has been inspiring and educating visitors since 1936. From its humble start with a collection consisting of only 13 pieces, this well-regarded institution has grown to include more than 15,000 American art works from the 18th to the 20th centuries. Visitors can access nine galleries, a gift shop, and the museum’s famed Sculpture Trail, which includes over 10 acres of gardens and lawns. The works exhibited at the museum are curated through the lens of life in Connecticut, giving visitors a unique opportunity to become better acquainted with the state as well as the city of New London itself. 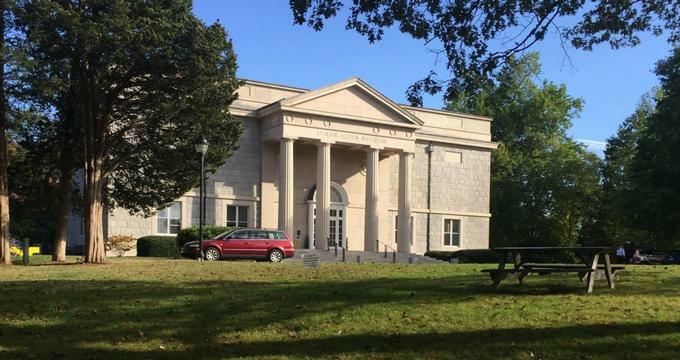 The Lyman Allyn Museum was the brainchild of Harriet Upson Allyn, a prominent Connecticut resident, who donated the funds for the creation of the institution that she named after her father, Captain Lyman Allyn. Aside from his work as a captain, Lyman Allyn worked in banking and insurance as well for the railroad industry. The museum building was designed by Charles A. Platt, who was known for his work on the Addison Gallery of American Art in Massachusetts. His design work resulted in the neoclassical structure visitors still see today. Since 1932, the museum has been providing quality programming and educational opportunities to the local community as well as to those visiting New London. Colonial life in Connecticut was dominated by merchants who arranged trade deals with the West Indies. Exporting food and livestock to the Caribbean, Connecticut residents obtained rum, sugar, and molasses. This robust trade ushered in a period of exceptional economic growth, allowing many wealthy Connecticut residents to acquire objects of great beauty and to showcase their status through art. This historical context allows visitors to fully appreciate the portraits that were produced at the time. A great example of such a work is a portrait of a local well-to-do woman, Sarah Deshon, which displays her conspicuous wealth to signal the family’s success. Connecticut’s geography also made it a key area in the Revolutionary War. As Connecticut residents were particularly poorly affected by what they viewed as unfair taxation and governance policies, they were more than willing to fight for independence from Britain. New London’s involvement in launching naval attacks from its strategically situated harbor prompted the British to burn the city during the Battle of Groton Heights. The political climate was reflected in the artwork of the period as well. The art of the 19th century was central in uniting the new nation around common goals, ideals, and a plethora of natural resources that signaled hope and opportunity. Despite the fact that industrialization, by way of steam power, was creating mass production and automation on a scale never seen before, the art of the time seems to harken back to a simpler, romanticized pastoral past. Visitors will likely notice that much of the landscape art of the time stood in stark contrast with the realities of 19th century life that the average person of the time would have faced. This is evident in Thomas Cole’s painting of Mount Etna. Using techniques and conventions from classical antiquity, Cole co-opts an ancient artistic vocabulary to spell out a set of ideals for the newly minted American dream. In so doing, his work set the tone for his contemporaries, many of whose works are also displayed at the Lyman Allyn Museum. Landscapes, still life paintings, and portraits are all well represented in the museum’s 20th century holdings. Visitors will be able to trace the decade-by-decade shifts in American art on display. Fueled by the rapid urbanization of American cities as well as the waves of immigration that followed, early 20th century art seems worlds apart from the tranquility and idealism of the preceding era. While a uniquely American style was quickly coming to the forefront, visitors will still be able to appreciate the way American artists of the time remained very much in dialogue with their European counterparts. The massive social and cultural shifts that occurred over the course of the 20th century are also reflected in the art on display. The 20th century brought much diversity to the art world as women, minorities, and other oppressed groups began to gain esteem as artists. Issues concerning race, gender, and identity are at the forefront of 20th century art and in many ways paved the way for artists today.